almond cake — Mel bakes things. Last weekend, I made a valentine cake. And it was delicious. I was impressed with myself. I don't typically make layer cakes. Mostly because transporting a layer cake is a huge pain-in-the-you-know-what, but also because...I am missing whatever gene is necessary to be a rockstar at fancy cake decorating. I am better at what we'll call "rustic" cake decorating. My version of rustic cake decorating is 1 part legit creativity and 2 parts preschool-style artwork. I'm totally okay with it. I own it. And oddly, I'm a pretty baller cupcake decorator. It's weird how that pans out, huh? See what I did there with my new alphabet cookie cutters? So cheesy. You should absolutely make your own almond paste. It is SO MUCH TASTIER than the store bought stuff. All you need is almonds, honey, water, and sugar. Here's a link on how to do it -- you can half the recipe and have way more than enough for this cake. If you want to have a chocolate-almond layer like I did, bake half your batter as stated in the recipe, and then fold 1/4 to 1/3 cup of cocoa powder into the remaining half before you bake. I actually ended up baking about 2/3 of the batter in round one (plain almond) and 1/3 of the batter in round 2 (chocolate-almond). My chocolate layer was much thinner. Which is fine, as I didn't want to overpower the plain almond layers. If you want an even showing of chocolate-almond and plain almond cake, divide your batter in half. I baked my cake layers in an 8x8 square pan, and cut the layers in half to make a cake that was 8" x 4". If you do this, you'll need to keep an eye on your cakes as your baking time might be a bit shorter. For chocolate hearts -- melt chocolate in a double boiler or the microwave, put it in a piping bag or a ziploc bag with one of the corners snipped off, and pipe directly onto a parchment-lined cookie sheet. I put mine in the freezer to help them solidify faster. I also made my own sprinkles. It was fun? But store bought ones are just fine, and probably won't start disintegrating into the frosting 5 hours after you make it. I added a thin layer of blackberry jam between my layers (in addition to the frosting). The "frosting" on this cake is actually just whipped cream. It balances the cake out perfectly. Make sure you whip your cream thoroughly enough that it is structurally sound. Also, this means you can't just leave this cake sitting out for long periods of time, lest your dairy spoil (ew) and whipped cream start to melt/un-whip itself (double ew). According to Molly, this cake is not to be made at any other time of year than Valentine's Day, but I can't say that I'll abide by that rule. It's too good to wait a full year before making it again! plus anything you want to use to decorate your cake! 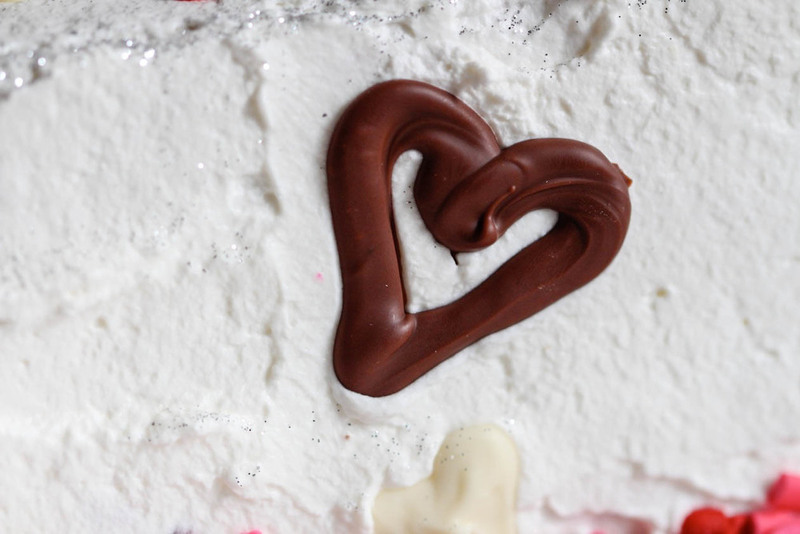 I used homemade sprinkles, edible glitter, and chocolate hearts. Preheat oven to 350F. Prepare your cake pans and set aside. Combine flour and baking powder in a small bowl and set aside. Beat almond paste and egg yolks until well blended, mix in vanilla and almond extract, and set aside. In a separate large bowl, beat the egg whites and salt until soft peaks form. Beat in sugar one tablespoon at a time and continue beating until stiff peaks form. Gently fold the whites into the yolk mixture and then gradually fold in the flour mixture. pour batter into prepared pans and bake for about 30 minutes, until a tooth pick comes out clean. Let cool completely. Sticking them in the freezer helps, and makes them easier to level and frost. For the frosting, whip up the whipping cream and add the extracts and food coloring. Level your cake layers (so you don't end up with a leaning cake...unless you totally dig that kind of thing, and then more power to ya). Frost and decorate your cake!